Since 2010, ELSSCAP has written and filed 22 amicus briefs, including certiorari stage briefs and merits briefs, and thirteen petitions for certiorari. 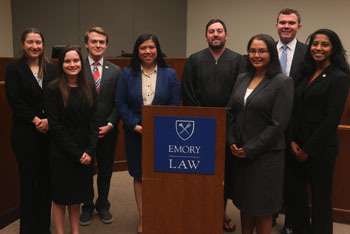 The Emory Law School Supreme Court Advocacy Program (ELSSCAP) is the only student-run Supreme Court litigation program in the United States, producing persuasive petitions for certiorari and amicus briefs in a broad range of practice areas, including administrative law, bankruptcy law, constitutional law, criminal law, and tort law. Students work under the guidance of experienced litigators as they handle all aspects of ELSSCAP's work, giving them a unique opportunity to choose cases, write briefs, and engage in significant issues that merit being heard by the US Supreme Court. The Emory Law School Supreme Court Advocacy Program provides students with experience in litigation, research and writing, compliance with court rules, and communication with clients and outside counsel. Professor Sarah M. Shalf, director of the externship program and a former clerk for the Court of Appeals for the 11th Circuit, is the current supervisor of the program. The Emory Law School Supreme Court Advocacy Program is recognized in the legal community for its many successes. ♦ Justice Breyer, in a dissenting opinion, cited a merits-stage amicus brief ELSSCAP filed in Florence v. Board of Chosen Freeholders on behalf of medical professionals. ♦ In 2012, the Supreme Court granted certiorari in one of ELSSCAP’s cases, Bullock v. BankChampaign N.A., a bankruptcy case regarding the definition of “defalcation.” On May 13, 2013, the Supreme Court issued a unanimous decision in favor of ELSSCAP’s client. ♦ National Law Journal recognized ELSSCAP’s public service efforts and profiled the organization for the amicus brief it filed in Florence v. Board of Chosen Freeholders. ♦ ELSSCAP won the International Municipal Lawyer's Association Amicus Service Award for the 2010–11, 2012–13, 2013-14, and 2014-15 school years for its work in representing the organization's interests. For more information about the Emory Law School Supreme Court Advocacy Program (ELSSCAP), contact us. Emory Law invites prospective clients who wish us to consider their cases to complete the online inquiry.